Feel free to watch my runs on stream via Twitch! Yes, I stream other things unannouced such as other games. What are the Rules for a twitch raid? If you are wanting to stream a nerkmid run please let me know before hand and we can go from there! Please do not have any identifying or obscene elements to your stream during the raid. Follow Twitch AND Neopets Rules please. I dont care about the chat language FYI just be civil. Nerk Runs must be at least 15+ Nerkmids! I will prioritize larger runs. I highly suggest going way over my minimum! DO NOT SEND NERKMIDS TO RAIDERS!! I only say this to keep people from getting in trouble as the machine has chances at paint brushes. Seriously, TNT can be cruel lol. I suggest having a moderator on your stream who is willing to input data and watch your chat during a raid. Only one person should be inputing your nerkmid run data into the form. We dont want a ton of people at once doing it causing duplicate data! What is the Nerkmid Project? 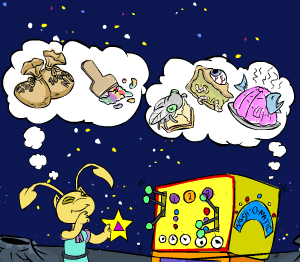 Let's face it, you like to gamble with the machine on Neopets. Those shiny nerks and the possibility of paint brushs are just too good to ignore! Nerkmania or The Nerkmid Project wants to see if we can figure if the machine is truly random and to help you keep track of your nerkmid runs and to see total stats that have been submitted! Let me go ahead and set a DISCLAIMER that the project WILL NOT GUARANTEE you high NP Or Paint Brush rewards. Theres no perfect combo. Why do you wanna do this? Some of you already know me as the Nerkmid Addict. Its true. I love to restock and waste np on this machine. I dont care about the rewards themselves. Its a really fun feature on neopets. Yes that means I have a gambling addiction. So do you don't lie! But this is really the only type of Gambling I like, free and virtual haha. I also LOVE seeing what everyone else gets! What can I do or how can I help? Submit your data! Tell people to do the same! How much data can I submit? As much as you like! The form currently accepts up to TEN at a time. We will be adding more functionality to make it easier for your nerkmid runs so please feel free to contact me if you have Questions or Suggestions! Side note: We are watching / Rejecting spam data. For example if we start noticing repeat data everywhere we will trim. Please be honest when submitting. Share it of course! The whole goal of The nerkmid Project is to see what we can figure out about the machine and show off what we got! We however will wait a short time before showing off ALL current data. This is just so that we can allocate everything while we build up a bit of data. The down time on search WILL NOT BE LONG. I promise. Some data will be available right away! Why do you need my USERNAME from Neopets? Your Username will be used to pull up your results. So lets say you want to go back and see how much NP youve gotten total, how many nerkmids youve used etc. Its for statistics only and to make it easier for you! We do NOT ask for passwords, ever. Why do you need my account age in months? There are several thoeries we would like to see if true or not. Rumour has it that account age can affect your "randomness". What is the Featured Nerkmid? Every month We will showcase a random Nerkmid along with a combo. Its not required that you use our featured combo. It just means we want to collect data on this particular combo for the nerkmid. Feel free to use any combo you want! We usually have a good reason for each monthly combo!